فولادی, علی, سرایی, علیرضا, کیانی, علی. (1397). پیش‌بینی و کنترل خواص مکانیکی کامپوزیت برید شده از طریق کنترل زاویه برید با استفاده از روابط میکرومکانیک برای تک تک وجوه مقاطع تخت. 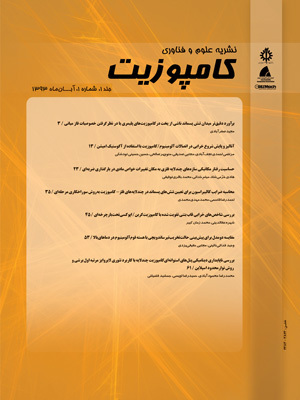 علوم و فناوری کامپوزیت, 5(4), 595-604. علی فولادی; علیرضا سرایی; علی کیانی. "پیش‌بینی و کنترل خواص مکانیکی کامپوزیت برید شده از طریق کنترل زاویه برید با استفاده از روابط میکرومکانیک برای تک تک وجوه مقاطع تخت". علوم و فناوری کامپوزیت, 5, 4, 1397, 595-604. فولادی, علی, سرایی, علیرضا, کیانی, علی. (1397). 'پیش‌بینی و کنترل خواص مکانیکی کامپوزیت برید شده از طریق کنترل زاویه برید با استفاده از روابط میکرومکانیک برای تک تک وجوه مقاطع تخت', علوم و فناوری کامپوزیت, 5(4), pp. 595-604. فولادی, علی, سرایی, علیرضا, کیانی, علی. پیش‌بینی و کنترل خواص مکانیکی کامپوزیت برید شده از طریق کنترل زاویه برید با استفاده از روابط میکرومکانیک برای تک تک وجوه مقاطع تخت. علوم و فناوری کامپوزیت, 1397; 5(4): 595-604. کامپوزیت‌های نساجی که از پیش‌شکل‌یافتهی نساجی به عنوان تقویت‌کننده استفاده می‌کنند، به دلیل سهولت تولید قطعات با اشکال خاص و ساختاری کارآمدتر و قابل‌اعتمادتر، به‌عنوان جایگزین مناسب برای چندلایه‌های متداول هستند. در میان انواع کامپوزیت‌های نساجی، کامپوزیت‌هایی با فاز تقویت‌کننده برید شده از اهمیت ویژه و کاربرد گسترده‌تری برخوردار است. در فرآیند بریدینگ یکی از مهم‌ترین مؤلفه‌ها در خواص مکانیکی کامپوزیت نهایی زاویه برید است. در این مقاله ابتدا به توضیح مختصر روابط تحلیلی جدید و راهکاری جدید جهت تغییر و کنترل زاویه برید بر روی تک‌تک وجوه یک مغزی تخت به کمک تغییر شکل حلقه‌ی راهنما از دایره‌ای به بیضی و کنترل خروج از مرکزی که قبلا توسط نویسندگان توسعه داده شده پرداخته شده است. سپس به ارایه برنامه‌ی کاملی پرداخته شده است که خواص مکانیکی کامپوزیت نهایی را بر اساس زوایای برید پیش‌بینی می‌کند برای صحت‌بخشی به نتایج حاصله به مقایسه نتایج حاصله با تحقیقات گذشته جهت بررسی صحت نتایج صورت پذیرفته است پس از بررسی‌های انجام‌شده مشخص گردید که نتایج حاصل از برنامه مورد نگارش و روابط میکرومکانیک جهت پیش‌بینی خواص کامپوزیت نهایی از صحت بسیارخوبی برخوردار است. بنابراین می‌توان به کنترل خواص مکانیکی بر روی هر یک از وجوه مغزی به کمک تغییر پارامترهای بیان شده دست یافت. Textile composites, in which a textile preform is used as the reinforcement phase, can easily take the form of complex parts and possess a more efficient and reliable structure, hence, they are a suitable substitute for conventional laminates. Among the textile composites, braided composites are of great importance and they are used more extensively, one of the important factors in mechanical properties of final composite part is the braid angle. In this paper, at first, a brief explanation of the new analytical relationships is presented. Also, a new strategy for changing and controlling the braid angle on each face of the flat mandrel by changing the shape of the guide ring from circle to an ellipse and also controlling the eccentricity is discussed which was previously developed by the authors. Then a comprehensive program is presented which predicts the mechanical properties of the final composite considering the braid angles. To validate the results, they are compared with the results of previous studies. After investigations, it was determined that the results of the developed program and micromechanical relationships show very good consistency in predicting the properties of the final composite. Therefore, it is possible to control the mechanical properties on any of the mandrel's faces by changing the mentioned parameters. Tang, Z. and Postle, R., “Mechanics of Three-Dimensional Braided Structures for Composite Materials–Part Iii: Nonlinear Finite Element Deformation Analysis“ Composite Structures, Vol. 55, No. 3, pp. 307-317, 2002. Shekarchizadeh, N., Abedi, M. M. and Jafari Nedoushan, R., “Prediction of Elastic Behavior of Plain Weft-Knitted Composites“ Journal of Reinforced Plastics and Composites, Vol. 35, No. 22, pp. 1613-1622, 2016. Akkerman, R. and Villa Rodriguez, B., “Braiding Simulation for Rtm Preforms“, 2006. Sanders, L., “Braiding- a Mechanical Means of Composite Fabrication“ SAMPE Quarterly, Vol. 8, pp. 38-44, 1977. Douglass, W. A., “Braiding and Braiding Machinery“, Centrex Publishing Company; Cleaver-Hume Press, 1964. Potluri, P., Rawal, A., Rivaldi, M. and Porat, I., “Geometrical Modelling and Control of a Triaxial Braiding Machine for Producing 3d Preforms“ Composites Part A: Applied Science and Manufacturing, Vol. 34, No. 6, pp. 481-492, 2003. Na, W.-J., Ahn, H. C., Jeon, S.-Y., Lee, J. S., Kang, H.-M. and Yu, W.-R., “Prediction of the Braid Pattern on Arbitrary-Shaped Mandrels Using the Minimum Path Condition“ Composites Science and Technology, Vol. 91, pp. 30-37, 2014. Chen, J., McBride, T. M. and Sanchez, S. B., “Sensitivity of Mechanical Properties to Braid Misalignment in Triaxial Braid Composite Panels“ Journal of Composites, Technology and Research, Vol. 20, No. 1, pp. 13-17, 1998. Omeroglu, S., “The Effect of Braiding Parameters on the Mechanical Properties of Braided Ropes“ Fibres and Textiles in Eastern Europe, Vol. 14, No. 4, pp. 53, 2006. Charlebois, K. M., Boukhili, R., Zebdi, O., Trochu, F. and Gasmi, A., “Evaluation of the Physical and Mechanical Properties of Braided Fabrics and Their Composites“ Journal of reinforced plastics and composites, Vol. 24, No. 14, pp. 1539-1554, 2005. Naik, R., Ifju, P. and Masters, J., “Effect of Fiber Architecture Parameters on Mechanical Performance of Braided Composites“ in Proceeding of 525-554. Duchamp, B., Soulat, D. and Legrand, X., “Deformability of Biaxial and Triaxial Braided Reinforcements“. Long, A., “Process Modelling for Liquid Moulding of Braided Preforms“ Composites Part A: Applied Science and Manufacturing, Vol. 32, No. 7, pp. 941-953, 2001. Fouladi, A. and Jafari Nedoushan, R., “Prediction and Optimization of Yarn Path in Braiding of Mandrels with Flat Faces“ Journal of Composite Materials, pp. 0021998317710812, 2017. Chamis, C. C., “Mechanics of Composite Materials: Past, Present, and Future“ Journal of Composites, Technology and Research, Vol. 11, No. 1, pp. 3-14, 1989. Naik, R. A., “Analysis of Woven and Braided Fabric Reinforced Composites“, 1994. Foye, R., “Finite Element Analysis of the Stiffness of Fabric Reinforced Composites“, 1992.